The story seems to be getting darker with The Dream Thieves and I found that the scope of the plot has also broadened considerably. Our Raven Boys aren't the only ones noticing the weird energy lines all over Henrietta; nor are they the only ones keen on finding the elusive Glendower. I can foresee things getting quite intense in the next installments in any event. As it stands, the way everything hit the fan at the end of book one with Adam's sacrifice and Ronan's big surprise reveal, well, things were bound to get interesting. And they did! Hell, they were more than interesting. Try addictive, all-consuming and oh-so wonderful! I happened to read this during an especially busy time in my life and it was sheer torture to have to put it down and walk away from the story - I kept wishing I could just forget the world and read the entire thing straight through. Every single chapter promised more than the last and damned if it didn't deliver right till the very end! Just when you thought Cabeswater couldn't get more enigmatic, you're floored with a big twist. Just when Ronan seemed as mysterious and magnetic as humanly possible, NOPE. He goes and reveals his dream powers and then we get to explore all of that with him. Hello jackpot! The characters and their development is just as layered and rich here as it was in the first book. We learn just as much new information about the boys and Blue as we did the first time around, which kind of blows my mind. 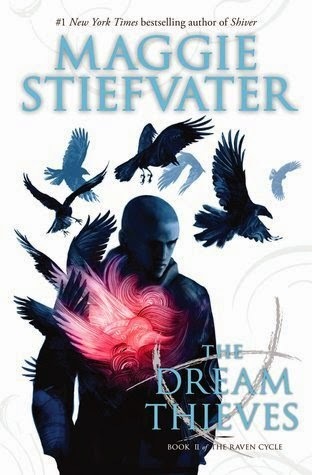 The entire story line for The Dream Thieves was incredibly well-plotted and flowed like only Maggie Stiefvater can seem to manage. I don't know how she does it, but with minimal drama she manages to make even the simplest of details utterly fascinating. New characters and new monsters are introduced and they all seem like such a natural progression to the story that while they are surprising, at the same time you just know it could never have gone down any other way. The whole thing was perfection to me, I just can not get over it. The Dream Thieves is a story that grabs you right from the start and never lets go, not for a second. It will invade your thoughts and, most likely, your dreams until you are consumed with longing for the next installment in an already stellar series. I.NEED. Blue Lily, Lily Blue. In my life. And quickly! I simply don't think I can survive much longer without it. Oh Micheline-I agree one trillion percent with everything you said in your amazing review! ❤ I was giddy with anticipation the moment I opened my copy of The Dream Thieves, a feeling that just magnified with every page I turned. I LOVE all the boys and Blue, but Ronan was especially a standout in this one (much to Ally's delight, as he's her favorite Raven Boy). And I TOTALLY ship that same ship you mentioned!!! Glad you are all caught up for Blue Lily, Lily Blue. I still need to get started on this series, I don't know what's taken me so long since I've read pretty much everything else of Stiefvater's. Do you know how many books will be in the Raven Cycle? I am too Mogsy, but now the hangover is almost unbearable LOL *sigh* Oh and there are supposed to be 4 books in the Raven Cycle total, so if you wait a bit you'll be able to read the entire series in one - which will save you much suffering xD I still need to read EVERYTHING else by Stiefvater, but luckily I own Scorpio Races and Shiver to get me going! Absolute fantastic review, Micheline - I'm so glad this didn't disappoint you, and that you enjoyed Ronan's point of view immensely. I did too - Ronan is such a great character, and Stiefvater is definitely a wonderful author for character development. Thank you so much Ebony! Yeah this was a brilliant sequel through and through and I couldn't agree with you more on Ronan - he's the best ♥ And Stiefvater is a goddess for coming up with him and the rest of the gang! Oh man OH MAN you have no idea how much you are making me want to drop everything and read The Raven Boys!!!! But ohhh I can't just yet! I haven't yet found the time :( But I know, I know exactly what you mean when you talk about Maggie's talent and all that she accomplishes in her writing because that was my experience with The Scorpio Races (my only Maggie read), as well. I just cannot wait to meet Blue and these boys!! Amazing review here, my dear! Haven't read your review for fear of spoilers as I haven't read the Raven Boys but I've heard so many good things about this series. Your rating only confirms that I need to read this asap :D! Awww thank you Kritika :D November needs to get here so we can all bask in out Blue Lily, Lily Blue feels togetherrrr! !